The next time you're looking for a weekend getaway, why not head to the islands rather than piling into the car for a drive up to the lake? It may seem distant, but nonstop flights can make some parts of the Caribbean a viable (and affordable) weekend destination, even if you live on the West Coast or Midwest. Location: You don't want to spend half of your weekend getaway on a plane, so the best weekend getaways are either close to the U.S. or have quick flight connections—ideally, three hours or less by air. From the East Coast and Canada, Bermuda is the geographically closest destination, followed by the Bahamas. From the West Coast or mid-America, consider Cancun. Transportation: The more airlines serving your destination, the more flight options you'll have. Popular destinations also have more nonstop service, meaning quicker flight times. Puerto Rico and Cancun are good examples of destinations that are further away mileage-wise but have plenty of nonstop flights that can make your actual travel time shorter. Cost: More competition among airlines usually equals cheaper airfares, especially in markets serviced by low-cost carriers. Ditto for destinations that have multiple resorts vying for your business. 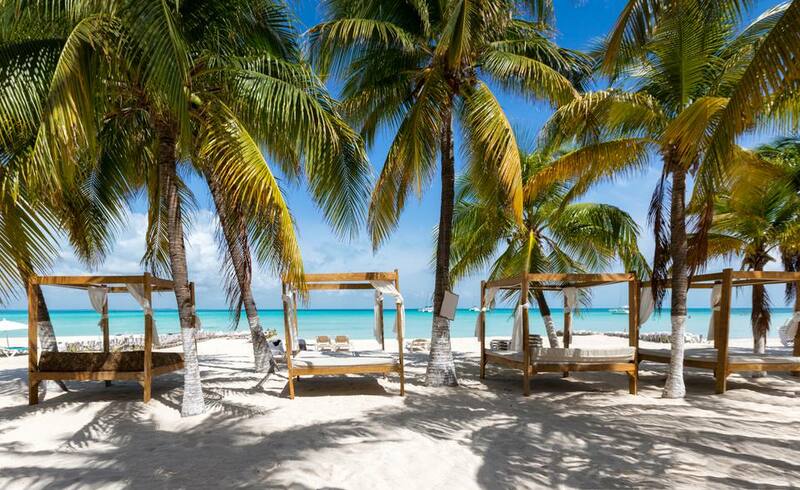 You don't want to break the bank for a few days away, even if they are spent basking in the Caribbean sun. Convenient hotels and attractions: Getting to the airport is only half the battle; once you arrive at your destination, you don't want to be spending more time in a bus or shuttle trying to get to your hotel. And once at your hotel, you won't want to be spending your precious weekend hours driving to far-off attractions. The resorts of San Juan, for example, are just minutes away from Luis Munoz Marin International Airport. San Juan, Puerto Rico is a popular weekend getaway destination thanks to its myriad of nonstop flights from the U.S., including service from low-cost carriers at prices that can make a few days in San Juan a reasonable alternative to a weekend on the Jersey Shore or Myrtle Beach. And once you touch down at Luis Munoz Marin International Airport, beach resort areas like Condado and attractions like Old San Juan, with its rich history and vibrant nightlife, are literally minutes away. San Juan accommodations range from budget to luxury, so you won't have to overspend for a quick getaway. JetBlue and Spirit Airlines compete with the major airlines like Alaska Airlines, American, Continental, Northwest, United, and US Airways. A nonstop from New York will have you in San Juan in 4 hours; a flight from Chicago takes just 40 minutes longer. Bermuda has a leg up on most other islands because it is further north and thus closer to continental North America; the drawback is that, unlike its Caribbean neighbors, Bermuda does not experience tropical weather year round, with a climate more like that of the Carolinas. Bermuda is just 693 miles south of New York (and 770 miles southeast of Boston and 729 miles south of Halifax, Nova Scotia), with direct air service from these cities as well as Atlanta, Charlotte, Chicago, Detroit, Ft. Lauderdale, Miami, Philadelphia, Toronto, and Washington, D.C. Airlines serving Bermuda include Air Canada, American Airlines, Continental, JetBlue, United, USA 3000, and US Airways. So, if you catch American Airlines' 9 a.m. daily flight out of New York/JFK, you'll touch down in Hamilton in just over two hours—about as long as it takes to drive from New York to Philadelphia. You could leave home on a chilly spring morning and be curling your toes in some pink Bermuda sand by lunchtime. Bermuda is just 20 square miles, meaning that no matter where you stay, you'll find all of the island's attractions just a short taxi or scooter ride away. If you have slightly more than a weekend, Royal Caribbean offers five-night cruises from New York and Baltimore to Bermuda between May and October. The Bahamas offer a pair of tempting destinations for weekend getaways and short trips. Nassau, home to Atlantis and the other resorts of Paradise Island and Cable Beach, is just three hours from New York and is well served by both traditional and low-cost airlines, including AirTran Airways, American, Air Canada, Air Jamaica, Continental, Delta, JetBlue, Spirit Air, and US Airways. Atlantis can be a bit pricey for a weekend away, but you'll find options like the Comfort Suites Paradise Island at about half the price. Many travelers also don't realize that the Bahamas are as close as 50 miles to the Florida coast, making sea travel another popular option. Celebration Cruise Lines offers every-other-day service between West Palm Beach and Grand Bahama Island. Plus, American Eagle is now flying nonstop on weekends from Chicago/O'Hare to Freeport; Continental has three-hour nonstops from Newark, and AirTran flies nonstop from Baltimore. With a new resort (the Hilton at Resorts World Bimini) and revived ferry service, Bimini is back on the map as a day tripping destination from South Florida that mixes the style of a South Beach influenced hotel with the substance of a laid-back Out Islands fishing community where a local's lunch of conch salad and Kalik is a must-do experience. Cancun, Punta Cana and Cozumel in the Mexican Caribbean are just 3 to 4 hours nonstop by air from the East Coast of the U.S. (5-6 hours from the Midwest), making it a viable weekend getaway destination, especially for bargain-hunters who can take advantage of low rates on Mexican all-inclusive resorts. If sleeping on the beach by day and partying all night is your idea of a Caribbean weekend blowout, head for the Riviera Maya.